Certain foods do not go well with others eg: Milk does not go well with most fruits inc. banana, yoghurt and banana are also incompatible. Click here for an great piece on incompatible food combos from Dr Lad. 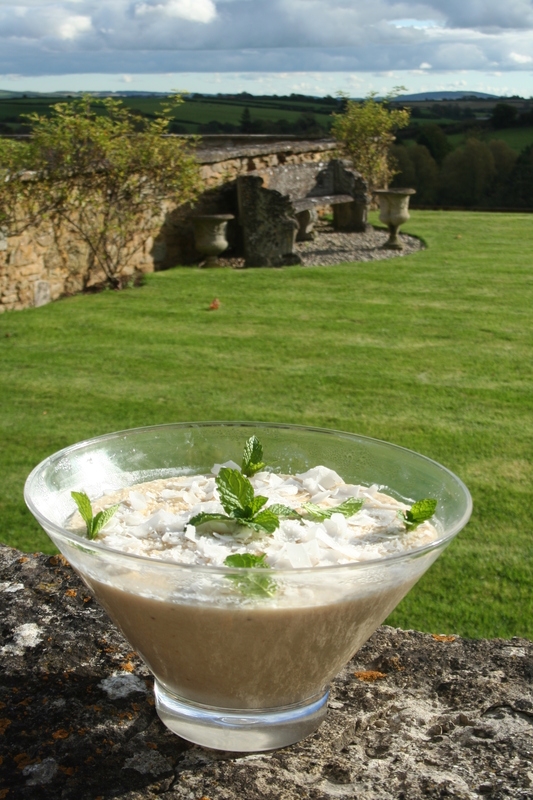 ‘Milk’:Throughout these recipes ‘milk’ can be taken as cow or goat’s milk, rice milk, almond milk or other milk substitute. Soya milk is less favoured unless it is very good quality (eg: Bonsoy) as it can be quite chalky and hard to digest. NB: Dairy milk from cows, goats does not combine well with many other foods such as bananas and other fruits, bread, meat, fish, yoghurt and sour foods. ‘Sweetener’: Refined white and even brown sugar have been stripped of vitamins and minerals which help the body digest sugar. Try experimenting with maple syrup, Indian Jaggery (raw palm sugar, pictured), date syrup, brown rice syrup, Agave syrup and other alternatives. Honey should only be used in recipes that do not require heating. 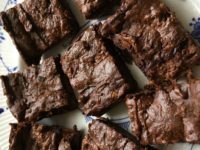 When baked, added to hot drinks or otherwise heated it ferments and blocks the body’s subtle channels. Adding honey to warm drinks is OK. Honey is the best sweetener for Kapha. Generally, try reducing sugar specified in most recipes, especially Indian recipes! ‘Salt’: Himalayan Rock Salt is an excellent salt as it is very easily absorbed with many beneficial effects. It does not increase blood pressure risk; is rich in minerals; assists the body’s pH balance; increases appetite, digestion and assimilation of food. It’s also favoured by Yogis as it calms the nervous system. It is milder than normal salt, and is available from good health shops or on-line. Fats/ Oils: Ghee is favoured for frying and releasing the aroma from spices. Oils which are liquid at room temperature should generally not be heated as they become unstable producing free radicals. 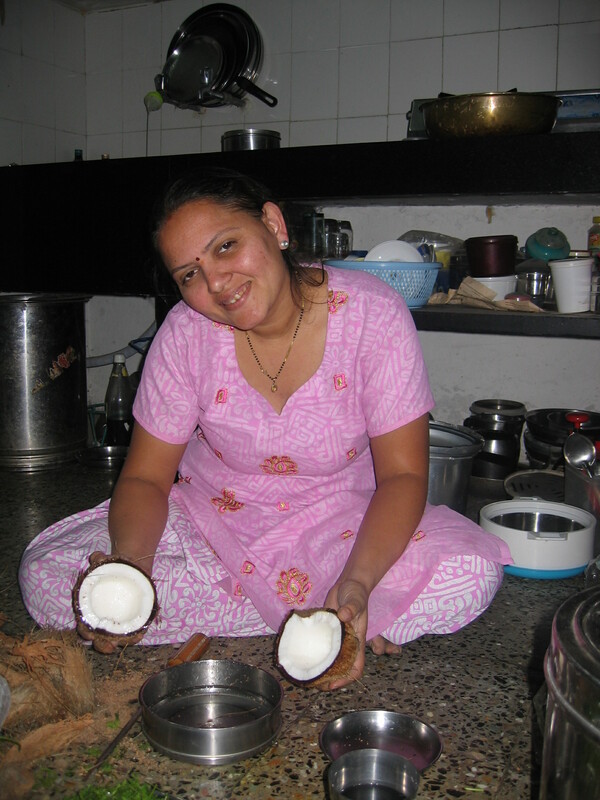 Fats which are solid at room temperature (coconut, ghee, animal fat) are more heat stable. Delicate oils, such as hemp seed oil, are best used after cooking, such as in dressings or drizzled over steamed vegetables. See below for ghee recipe. See Erasmus’ book ‘Fats that heal, Fat’s that kill’ (1993) for more. Asafoetida/Hing:A little known plant gum resin widely used in Ayurvedic cooking to Vata aggravation (and hence gas!). It enkindles agni and discourages growth of parasitic worms in the large intestine. A small pinch can be added to almost any lentil, bean and cabbage dish in the early stages of preparation to increase digestability. Any more than a pinch will aggravate as it’s hot and sharp. Ghee- an essential in any Ayurvedic kitchen! Ghee is one of the lightest oils, ideal for cooking as doesn’t burn easily. Digestive, improving absorption and assimilation, ghee nourishes, improves memory, lubricates, makes body flexible (good with yoga!). Its most beneficial to Pitta and Vata types, and Kapha types should consume in limited amounts. Ghee helps clean channels and carries medicinal properties of herbs to tissues. NB: People of kapha constitution/ kapha imbalance (eg: cholesterol problems) should use only a little ghee (one teaspoon a day). Place one or two bars of unsalted butter in a saucepan until it boils; then lower the heat. When the white foam of milk solids which will accumulate on the top begins to collapse and thicken, start skimming it off. Do not disturb the bottom of the pan, as some of these solids will also sink and can be left in the pot until after the ghee is poured off. As the butter continues to boil, watch the oily portion to see when it becomes clear, and watch the sediment on the bottom to see when it turns a golden brown. Be careful this does not burn! When all the water is evaporated, the bubbling sound will stop. When only the clear oil and the golden sediment remain, the ghee is ready. Remove from the heat, and let it sit for a moment. Pour the ghee off into an earthenware, glass or metal container (not plastic- it will melt!) Ghee doesn’t need to be in fridge but do keep out moisture. Don’t use a wet spoon! Keeps for 3 months. Breakfast is an essential meal for Vata and Pitta types. Kapha types may not be hungry till later in the morning and should wait for genuine hunger before eating! Peeled almonds (rejuvenating), pistachios (tonifying), cashews (magnesium rich), dates (strengthen liver, used to treat alcoholics! ); raisins (balance doshas). This drink is good at any time of the day or night! Soak nuts and dried fruit overnight or for at least two hours. Blend with ‘milk’ (or water used to soak) till chewy. Add rosewater, cardamon powder (sweet, calms, stimulates digestion) and saffron (cooling, tonifying, good for women, balances all doshas). Try ground fennel seeds (sweet, digestive, tones stomach) instead of saffron. You can add ‘sweetener’ according to taste though the dates are already sweet. Soak a cup of almonds overnight and peel off the skin the next day. Blend together one cup of soaked almonds with 2 cups of water. Strain off the almond milk through a muslin or sieve. You can drink as it is or add some warming spices such as cinnamon, ginger and cardamom. Another idea is to blend almond milk with some soaked dates. 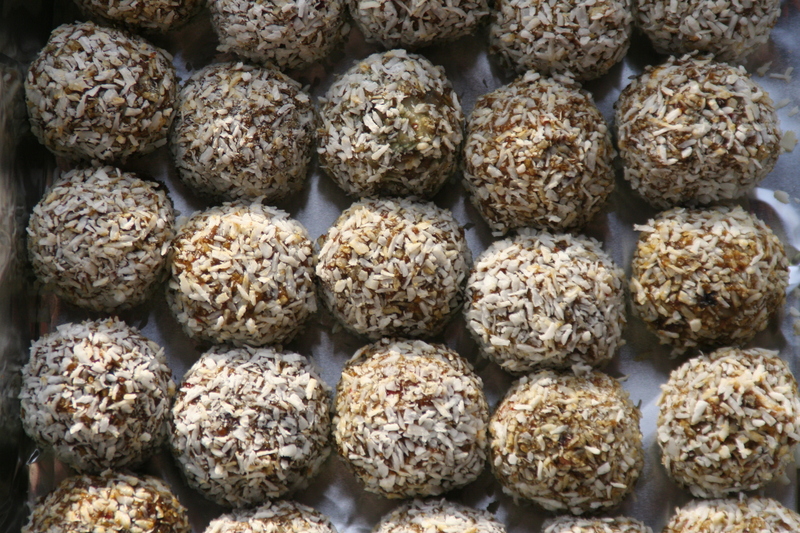 You can use the leftover strained almond pulp to make delicious energy balls (see below). Wheat flour pancakes made with milk and eggs can be heavy to digest. try these quick and light pancakes for a tasty breakfast or snack. They really taste like they have added egg. Soak 2 cups of quinoa grains overnight in just enough water to cover. Add a pinch of salt to taste and blend in a food blender for a few minutes until smooth. If you want instant pancake batter, you can use ready made quinoa flour instead and blend with water and a pinch of salt to make an instant batter. Add a little ghee or coconut oil to a hot frying pan, add a ladel of batter and fry pancake. These can be served with sweet or savoury. Suggested toppings include: houmous, avocado, honey, apple jam….whatever you fancy! You can also try semolina pancakes using coarse semolina (one cup) & yoghurt (1/2 cup). Blend with water, and a pinch of cinnamon and cook as above. 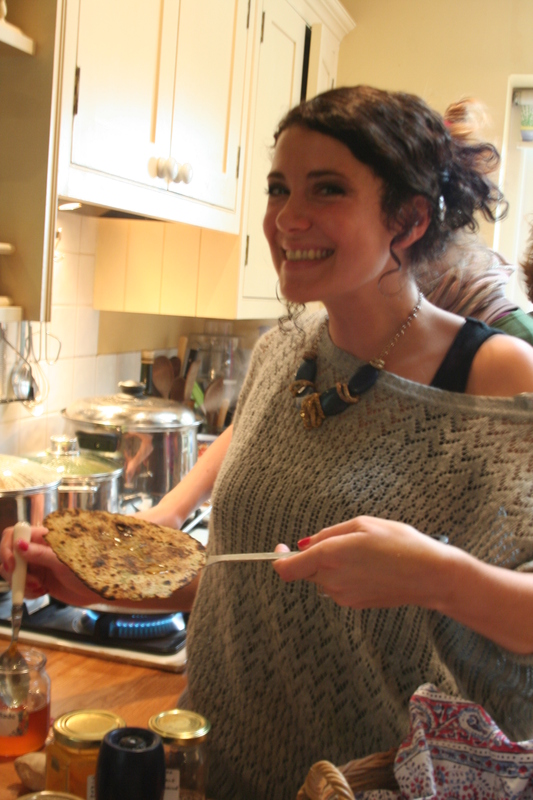 Other alternative flours to wheat include buckwheat, spelt, and mung dhal flour- all of which can be used to make delicious pancakes. Have fun experimenting. Soak a few raisins, dates, dried figs, apricots (as desired) overnight in a pan of water. You can also add sunflower, pumpkin, sesame, linseed, blanched almonds, hazlenuts, shredded coconut. In the morning bring this to the boil and add rolled oats (or millet, quinoa, barley flakes etc) and cook till soft. Add some cinnamon powder and a few crushed cardamom seeds. To make creamier porridge you can use oat, soya, rice or almond milk instead of cow’s milk which is too heavy in this recipe. To sweeten, add any syrup of your choice (date, maple, barley, rice etc), fruit spreads along with hazlenut or almond butter. Avoid adding honey until porridge has cooled right down. Soups- highly digestable so good for those recovering from illness or with poor digestion (low agni). 4 cups mixed vegetables according to what’s in season (eg: carrots pacify Vata and Kapha but aggravate Pitta but cooking mixed vegetables with these seasonings makes a soup tridoshic), 8 cups of water, 1 tsp cumin seeds, 6 peppercorns, 1 inch of cinnamon stick, 10 cloves, 10 cardamom pods, 2 tbsp ghee and a pinch of salt. Cut vegetables into bite sized pieces and cover with water. Cook on medium heat until tender. Grind cumin seeds, peppercorns, cinnamon stick, cardamom pods and cloves in pestle and mortar or blender. Add ghee to large saucepan and then ground spices. Sautee for a moment but be very careful not to burn them. Add the vegetables and 4 cups of the water they were cooked in. Boil for 2 minutes, add salt and serve. Serve with chapattis. 2/3 medium carrots per person; 1 large onion; 2 potatoes; large bunch coriander; black pepper; vegetable stock (Marigold Swiss Vegetable Bouillon brand is good); an inch of ginger. Lightly sweat onion in ghee, adding vegetables (finely chopped) and ginger. Fry for a few minutes then add pepper and half of coriander coriander. Cover with stock and simmer till vegetables are soft. Liquidise to a puree in blender, the return to pan, adding more stock if too thick. Add rest of coriander (finely chopped) and serve. For a more substantial meal, cook red lentils separately in stock and add to the finished soup before serving. Mung beans are less gas-producing than other beans, help remove toxins from the body (including heavy metals!) and stimulate the digestive fire. This dish will balance all three doshas. The following soup recipe is highly nutritious and naturally detoxifies the body. It works by cleansing the liver, gall bladder and vascular system of any ama (undigested toxins). Wash the mung beans and soak for at least four hours or overnight. Heat ghee or olive oil in a pan and add teaspoon of turmeric and 2 pinches asafoetida (to prevent gas). Sauté for a few seconds then add the beans, fresh water and fresh root ginger. For one part soaked mung you need about four parts of water. Simmer for 30-40 minutes adding more water if necessary, until beans are soft. In a pressure cooker this takes 8 minutes once the vessel has come to pressure. You can then turn off the heat and leave the pot to cool for a further 10 minutes before opening it. Once the beans are cooked, heat ghee or olive oil in another pan, add 2-3 cloves chopped garlic (if you wish) and sauté lightly for a minute until soft. Add chopped fresh root ginger, then one teaspoon of cumin and coriander seeds plus any other herbs or spices (except chillies) eg: cardamom, black pepper, cumin seeds and briefly sauté. Add these sautéed spices plus some rock salt into the beans and simmer for a further few minutes. Serve soup warm with a squeeze of lime juice and some fresh coriander leaves, finely chopped. You can also add green leafy vegetables, pumpkin, leeks, courgette, fennel, parsley, mint, coriander, or basil for variety. You can also add 1 tsp. of ghee or – if you are vegan or do not like the taste of ghee – 1 tsp. of an omega 3/6/9 oil. Omega oils should be added to food after it has cooled down a bit, as these oils are not heat stable and thus also not suitable for cooking. Rice features heavily in the Ayurvedic yogic diet. It has a balancing effect on the digestive system and soothes the nervous system. The most popular rice in Ayurveda, basmati rice is a light and aromatic long-grain variety with the cooling effect on the body. Good for calming an irritated gut and easier to digest than brown rice. Lighter than many other grains, so can be eaten by Kapha; it’s cooling, sweet and moist nature work for Pitta; and sweet moist attributes balance Vata. Easy to digest but add a couple of cloves to rice when cooking normally to gently warm the slight coolness of the grain. Wash rice in cold water to remove much of the starch (which aggravates Vata, grains that are at least 3-6 months old are preferred as bacteria will have digested some starch), changing the water until the water is clear. Bring just under twice the volume of water to the rice to boil, adding the rice and a pinch of salt to taste, reduce the heat, cover and cook for 10-15 minutes by which time all the water should be absorbed. Remove from the heat and allow to stand for 5 minutes before removing the lid. Rinse the rice first, then cook in a heavy-based saucepan with a tight fitting lid. The general rule is one measure of rice to two or two and a half measures of cold water. Bring to the boil, then reduce the heat, cover the pan and simmer gently for 40-50 minutes. Do not remove the lid during this time as the steam plays an essential part in the cooking process. After about 45 minutes the water will have been absorbed and the rice will be tender with a delicious chewy texture. Another way to cook rice is to gently toast it in a dry pan for a few minutes, then add the water and cook as above. This dish is good for migraine type headache, and for revitalising the blood, circulation and female reproductive system. Saffron is sweet/ astringent/bitter in taste, heating and with a sweet aftertaste. It balances all three doshas, is easy to digest and helps with food allergies. 1 pinch saffron, 1 tbslp water, 1 ½ cups basmati rice, 3 tbsp ghee or unsalted butter, 4 bay leaves, 7 small pieces of cinnamon bark, 7 cloves, pinch of salt, 7 cardamom pods, 4 cups hot water. Soak saffron in 1 tbsp hot water for 10 minutes. Wash and rinse rice twice and drain. Heat pot, add ghee and then all the spices except saffron. Turn heat down and add rice and sauté in spices for 2 minutes. Pour in hot water and soaked saffron and bring to gentle boil. Boil uncovered for 5 minutes, stirring once or twice to keep from sticking. Turn heat to low and fully cover and simmer until tender (about 10 minutes). Cumin Rice: Cook basmati rice and cool. Heat 1 tbsp. ghee, add 2 tsp. cumin seeds and fry to release aroma. Add cooled rice, a handful of freshly chopped coriander and a little lemon juice. Lemon rice: Cook rice and add a handful of chopped cashew nuts. Heat 1 tbsp. ghee, add ½ tsp. mustard seeds and heat till they pop. Add to rice with juice of one lemon and ½ tsp. turmeric. Garnish with shredded coconut. 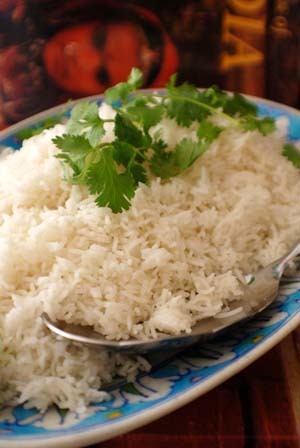 Coconut rice: Fry one finely chopped onion and 2 chopped garlic cloves in 1 tbsp. ghee. Stir in uncooked rice and 50g dessicated coconut. Add pinch of salt and just enough water to cover rice. Bring to boil, cover and simmer until water absorbed. Stand for 5 minutes before serving. Rice with almonds: Cook rice. Dry roast 50g flaked almonds and about 40 pine nuts. Once rice cooked, transfer to bowl, mix with nuts and 3 tbp. each of chopped parsley and coriander, a pinch of cayenne pepper and a pinch of chilli flakes. Pilau rice: Cook rice and when water almost evaporated, add your choice from the following: raisins, almonds, cashews, pistachios, and green peas. Add a cinnamon stick, ½ tsp. cardamom powder, a few cloves, a bay leaf and a pinch of salt, along with a little more water. Stir well, cover and leave for 20 minutes. Healthy fried rice: Steam a mixed selection of vegetables (eg: carrots, cabbage, broccoli). Cook rice. Heat 1 tbsp. ghee and add ½ teaspoon cumin, turmeric, and ground coriander. Add vegetables, salt, ½ tsp. cardamom powder and then rice. Mix well and serve. This recipe plays a key role in Ayurvedic nutritional healing, especially during illness and detoxing. It is also widely eaten by sadhus, who leave it to cook while they are meditating. Mung dhal is tridoshic, and together with rice provides a complete source of protein. If you are doing a lot of pranayama or live in a cold climate, be sure to add the ghee. Especially easy to make in a rice cooker (pictured). Brown rice or barley may be substituted for the basmati rice to make the dish heartier. If you have good agni, you can try making kitcheri with split urad (black dhal)which is higher in protein but harder to digest. This dhal is considered the equivalent of meat in Ayurveda. 1 cup basmati rice; 1 cup yellow or green mung dhal; 1 inch chopped ginger (for vata and kapha, warms, potent digestive stimulant), 2 tbsp. shredded coconut; 1 handful of coriander leaves,3 tbsps. ghee or coconut oil; 3 bay leaves (warms, digestive), 1.5 inch fresh cinnamon bark, 5 cardamom pods, 5 cloves, 10 black pepper corns, ½ teaspoon each of turmeric, cumin seeds, fennel seeds, 1 pinch of hing. Optional: one cup of diced carrots or celery; fresh lemon juice (to increase agni) and chopped coriander leaves to serve. Soak dhal for a few hours to make it more digestible. Wash rice and dhal separately in at least 2 changes of water. Blend the ginger, coconut, coriander and ½ cup water. Heat large saucepan, add ghee or coconut oil, cinnamon stick, cloves, cardamom, peppercorns, fennel seeds, cumin seeds and bay leaves. Stir for a moment until fragrant. Add blended items, then hing, turmeric and salt. Stir until browned. Stir in mung dhal and rice and mix very well. Add 6 cups of water, cover and bring to a boil for 5 minutes. Then simmer until dhal and rice are soft (25-30 minutes). You can add vegetables that suit your constitution for a one pot meal. Use one cup of split moong dhal and one cup of basmati rice. Wash then add 6 cups of water. Add salt and turmeric and bring to the boil the simmer till cooked (or use rice cooker). Add pinch of cardamom and pinch of clove powder (not in Summer). Add a little cumin fried in ghee. A delicious tridoshic combination of the above kitchari recipe and a buttermilk soup which can be eaten at anytime of the year, for lunch or dinner. Very good for Irritable Bowel Syndrome; with a cold as it pacifies Kapha and does not increase congestion; in pregnancy/ breast feeding. Mix 200g of yoghurt with one and a half times the amount of water. Heat 1 tbsp ghee, add ½ teasp each of mustard and cumin seeds, some freshly grated ginger, ½ chopped green chilly, 2 chopped cloves garlic and 5 curry leaves. Once seeds have popped, allow to cool and add to diluted yoghurt. Add fresh coriander chopped, a little salt and a pinch of turmeric and chilly powder. Add 2.5 heaped teaspoons of chickpea flour or barley flour and mix well. Serve hot. Vata types can add more ghee, Pitta can omit the garlic and chillies, and Kapha types can use less ghee and more spices. Serve hot with either kitchadi or rice and chappatis. The essential protein element in Ayurvedic vegetarian cooking. 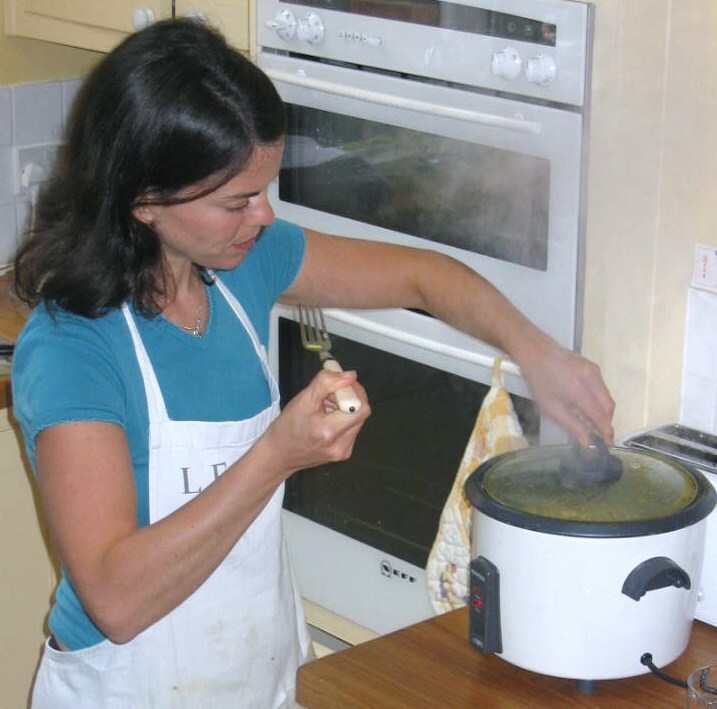 In Summer- make the dhal thinner so its easier to digest. In Winter you can eat it quite thick. 200g red lentils/ green whole moong dhal/ split green or huskless yellow dhal; 750 mls water, 1 tsp turmeric, 1 bay leaf, 2 tbsp. ghee, pinch of hing, 2 tsp mustard seeds, tsp cumin/ fennel seeds, 2 tsp ground coriander, 2 tomatoes chopped roughly, 1 tsp salt; lemon juice, 4 tbsp fresh coriander. Boil lentils, turmeric and bay leaf, simmer for 15 mins until tender; Heat ghee, add mustard seeds, cumin, fennel, and hing until they pop. Add coriander, tomatoes and cook for 5 minutes. Add mixture to lentils along with some water if too thick. Cook for a few more minutes. Add salt, lemon juice and coriander to serve. 110g dried chick peas, ½ teaspoon cumin seeds, ½ teaspoon coriander seeds, 1 large onion (diced), 1 carrot (diced); 3 cloves garlic, finely chopped, ½ teaspoon turmeric, 2.5 cm ginger root, 75 g cashew nuts, 50g ground almonds, 220g spinach, a handful of freshly shelled peas, pinch of salt, squeeze of lime, 130 ml coconut milk, 1 bunch coriander, chopped and some ghee for frying (or coconut oil): Soak chick peas overnight and simmer for one hour till tender. Toast seeds and grind with pestle and mortar. Heat 2 tbsp. ghee, fry onion, carrot, garlic, ground spices, cooked chickpeas, turmeric and ginger using more ghee if necessary. Add cashews and almonds, stir and add water to barely cover. Simmer for 25 minutes until almonds have thickened the curry. Add spinach and peas and cook for 5 minutes. Season with salt and lime juice, adding the coconut milk and half the coriander. Sprinkle remaining coriander on top. NB: Vata types should avoid chick peas which are too heavy for them to digest. The preferred Ayurvedic method for cooking vegetables is to sauté them in ghee or steam in a little water. Adding salt at the beginning reduces the cooking time. Excess raw vegetables are not advised as they are heavy and hard to digest! Raw food is better in Summer, or at lunch time when digestion is strongest. Basic sauce for any vegetables: Add 1 tsp. teaspoon turmeric to safflower oil/ ghee, and heat. Add water, cut vegetables, ½ coriander powder, chilly powder, cinnamon and cardamon. Blend a good handful of almonds and add to sauce with salt and a little jaggery to taste. Basic recipe for any vegetable eg: Okra. Wash, soak and dry okra, then slice. Fry in ghee, with mustard and cumin seeds. When cooked add salt, turmeric and a little chilly powder to keep things simple and get the taste of the vegetables. NB: Don’t cover okra when cooking or it becomes sticky! For any dark green leafy vegetable: Toast 2 tbsp. sesame seeds until slightly golden. Stir fry 4 cups chopped green leafy vegetables with 2 chopped garlic cloves, 1 tsp.chopped ginger. Sprinkle with toasted sesame seeds and salt if desired. Tridoshic Vegetable Curry: Heat 2 tblsp. ghee, add½ -1tsp. cumin, mustard seeds, ajwan and pinch of hing. When seeds pop add ½ tsp. turmeric and cayenne, then 4 cups mixed chopped vegetables and salt. Stir to coat with spices. Turn down heat, cover and stir after 5 minutes. Continue to cook on low for another 15 minutes until tender. Serve with a wedge of lemon. Best eaten at lunchtime or in Summer as raw food is hard to digest. 150g brown rice, ½ pint water, 35 ml olive oil or tahini, 1½ tbsp. lemon juice; 2 tbsp. chopped herbs (parsley, basil, mint, lemon balm), 250g mixed vegetables (asparagus, avocados, carrot, celery, cucumber, fennel), salt and pepper. Cook rice then toss with olive oil, lemon juice, fresh herbs and diced vegetables. Season with s&p. Allow to sit for two hours. You can lightly steam the vegetables to make more digestible. 4 cups finely chopped parsley; 1 cup sprouted quinoa (soak for 8 hours and allow to sprout for one day); 4 medium lemons; ½ cup olive oil; 2 finely chopped cucumbers; 2 finely diced tomatoes; 2 tablesp. dried mint; salt and freshly ground pepper. Drainquinoa and squeeze out as much moisture as possible. Put in large bowl and place cucumbers and parsley on top. Blend lemon juice olive oil, mint, s&p until smooth. Pour half over quinoa and marinate for ½ hour. Add remaining dressing and toss before serving. Grate 2 cups of carrots, juice of one lime, chopped fresh mint, dash of honey and freshly ground coriander seed. 2 cups rye/ spelt/ buck wheat/ barley flour (or a mixture of these); 1 teaspoon salt; 3/4 cup warm water; 1 tablespoon ghee (optional) to make about 12), teaspoon of ajwan/ cumin (to increase digestibility, especially good for new mothers). Put the flour, ajwan, cumin and salt into a bowl. Add the warm water and oil/ghee and mix to pliable dough. Leave to rest cover for at least 30 minutes- 1 hour. Then knead again well on a floured surface (for at least 10 more minutes- the more it is kneaded, the lighter the bread will be). Turn onto a floured board, and make small balls with dough. Press flat in hand, add some ghee and fold into four sealing corners well. Roll out into chapatti shape by turning each time you roll, till paper thin. Heat a frying pan until medium hot, and then cook each chapatti for 15-20 seconds on each side, turning when brown spots appear underneath. Press lightly all over using a clean cloth and the chapatti will buff up. You can also try cooking them directly on the gas. Wrap them in a clean cloth to keep them hot and soft. A little ghee/butter on one side would make it tastier. To save time during busy day, one can make the dough a day before and store in the refrigerator overnight. Put dough and put in a warm room for an hour before rolling out. Chop a small bunch of coriander leaves and small bunch of fenugreek leaves (methi) leaves. Crush 2 cloves of garlic. Add to basic chappati recipe above, mixing garlic and greens in with flour. Add teaspoon turmeric, and of cumin, 2 teaspoons chill powder, 2 pinches of hing. Knead thoroughly then leave dough to rest for 30 minutes. 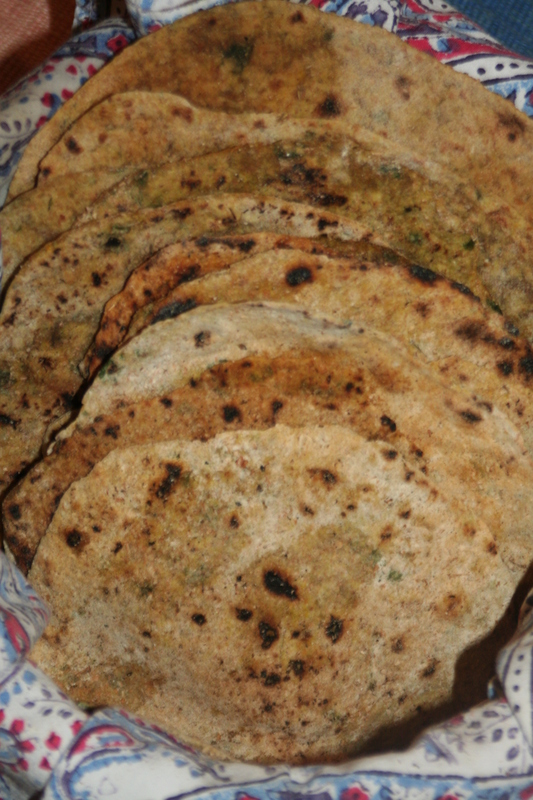 Roll out and cook parathas as for chapattis. You can make these with any green leafy vegetable such as spinach. These are heavier to digest than plain chapattis, so best at lunchtime. A useful way to balance a meal eg: using coriander and coconut to cool or ginger to stimulate digestive fire (agni). Serve at room temperature; keep for 1-2 days covered in fridge. Data and Tamarind Chutney: Crumble spoonful of jaggary into saucepan with a little water. In a bowl put a small block of tamarind paste (sour pulp, enhances digestion) and hot water to make a paste. Sieve to remove seeds. Add to pan, along with dates and figs and simmer with water for half an hour or longer to get the desired consistency. Keeps for 2 months in the fridge. Raisin and ginger Chutney: 1 cup (150g raisins), 2 tbsp hot water, 1 ½ tsp chopped ginger, ¼ tsp cayenne pepper, ¼ tsp salt; juice of half a lemon. Soak raisins in hot water for 15 minutes then blend all ingredients, adding lemon juice last. Green Chutney: Blend a bunch of fresh mint and coriander, 2 chillies (according to taste! ), one cup of lemon juice and 8 tomatoes with a good pinch of salt. Coconut chutney: 2 cups desiccated coconut (or fresh coconut grated from a brown coconut); ½ cup ground almonds, 1.5 inch of finely chopped ginger, ½ small green chopped chilly, 1 tbsp. chopped coriander, 2 cups water, 2 tbsp. ghee, ½ teasp black mustard seeds, ½ teasp cumin seeds, pinch of hing, 5 curry leaves, ½ lime, ¼ tsp. salt. Blend coconut, almond, ginger, green chilly, and coriander. Add water until smooth. Heat ghee and fry remaining spices until mustard seeds pop. Pour into blender and add lime juice, salt and gently mix. Raisin and coriander chutney: 1 cup of raisins, soaked for one hour in water or simmered for 5 mins; 3 large handfuls of fresh coriander leaves; half an inch of grated ginger root; 1/4 tsp black pepper; 1/2 lemon’s juice; 1 tsp dry roasted poppy seeds (optional). Place everything in blender except poppy seeds and blend to fine paste. Stir dry roasted poppy seeds into chutney. 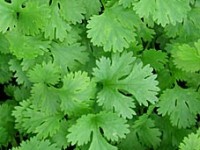 Coriander is excellent for enhancing absorption of minerals and for removing heavy metals from the blood and liver. 1 cup of raw, grated, beetroot, 1 tbsp ghee, ½ teaspoon black mustard seeds/ cumin seeds, 1 pinch hing, 1 tablespoon chopped coriander, ½ green chilli/ large pinch of cayenne, 5 curry leaves; 1 cup plain yoghurt, pinch of salt. Add beets to yoghurt. Heat ghee, add mustards seeds, cumin, hing till seeds pop. Add coriander, curry leaves and chilli. Mix and remove from heat, adding to yoghurt once cooler. Spices make the yoghurt lighter. Beets are a blood tonic but can aggravate Pitta in excess, coriander helps cool. 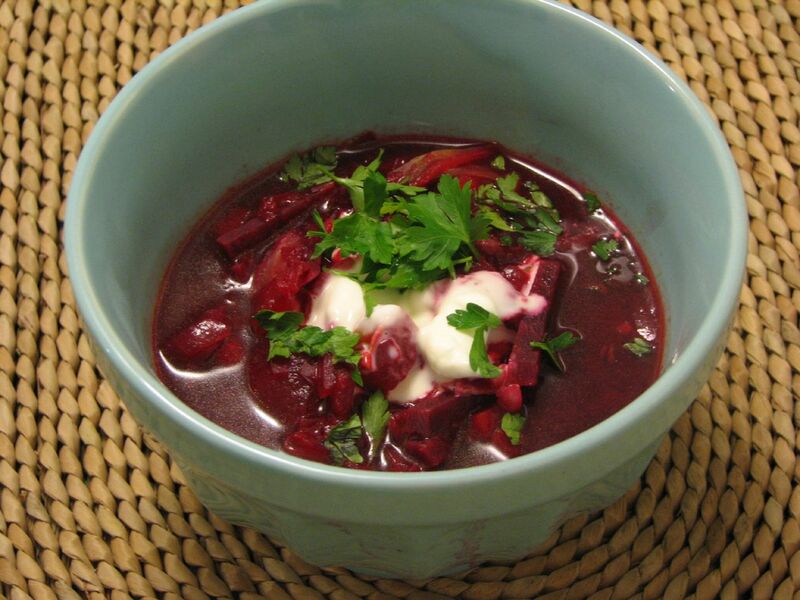 You can also try substituting cucumber for the beetroot in this recipe to make Cucumber raita. Best eaten at lunchtime as yoghurt is quite heavy for the evening though the spices make it more digestible. Yoghurt can block the channels so only eat a few times in a week. Don’t eat plain yoghurt at night as it will form mucous. ½ cup fennel seeds, ¼ cup toasted coriander seeds (with hard outer shell removed, often roasted with turmeric); ¼ cup sesame seeds, 1 tablespoon cumin seeds, 1 tablespoon ajwan seeds, 2 pinches of rock salt, 1 tablespoon hot water. Dissolve salt in hot water. Heat heavy cast iron frying pan and roast fennel seeds for 2 minutes, stirring constantly until slightly brown. Sprinkle on salt water and stir and toast until dry and fragrant. Pour into dish. Roast remaining seeds, each kind separately for a minute or so until fragrant and slightly brown. Add to fennel seeds and mix well. Store in glass jar and eat teaspoonful after meals for good digestion and sweet breath. Puddings should be taken in moderation as heavy as they can inhibit digestion, creating toxins (ama) and weight gain. 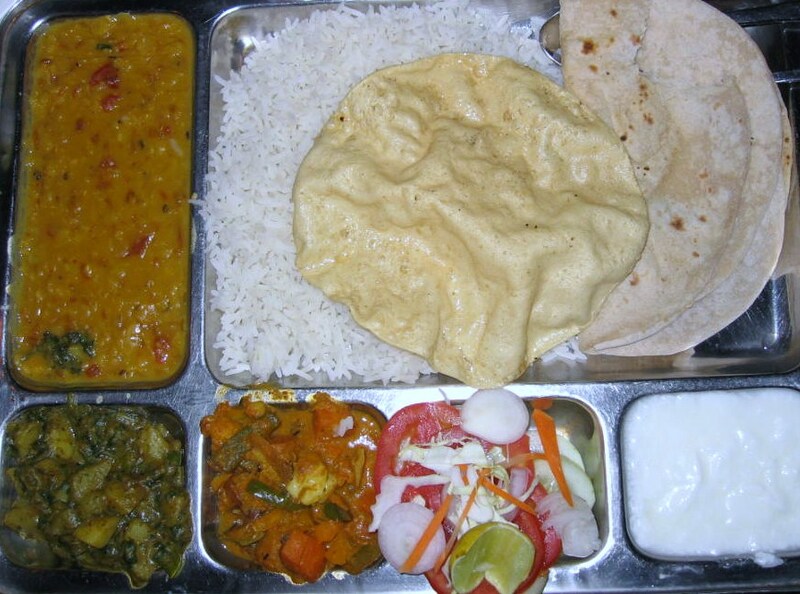 Traditionally eaten at the beginning of an Ayurvedic meal, preferably lunchtime, when digestion is at its peak. 6 ripe but firm pears, 4 pitted dates, juice of one orange, 2 tsp maple syrup or date syrup, 1 tsp ground cinnamon,, ½ tsp fresh grated ginger, ½ tsp grated orange zest, 2 tbsp shredded coconut (optional). Peel each pear, leaving stalk and cut thin slice off base so it stands up. Place in sauce pan with inch of water and bring to simmer. Add dates, orange juice, zest, and syrup, and cinnamon, ginger and simmer until pears are tender (about 12 minutes). Remove ears and place on serving plates. Continue to simmer liquid in pan, stirring all the time until it thickens enough to spoon glaze over pears. Garnish with coconut to serve. For Kapha in moderation! This comforting, old fashioned recipe is idea for balancing Vata in Autumn, as it involves eating seasonal, organic food. Ayurveda considers cooked food as easier to digest than raw and this recipe is no exception. You need: 4 cooking or eating apples, peeled, cored and sliced;5 organic figs or dried apricots (soaked in water overnight); 5 organic dates (dates are intensively sprayed with pesticides so especially important to buy organic! ), pitted and chopped OR two handfuls of raisins; 2 tbsps of Agave syrup (a naturally low GI sweetener) maple syrup, jaggery OR brown sugar. Do not use honey as Ayurveda considers it to ferment when heated with detrimental effects when eaten! 1/2 tsp each of ground cardamom, cinnamon and nutmeg or a teaspoon or mixed spice; 1 tbsp grated fresh ginger; 4 cups of water. Add ingredients to saucepan, bring to boil and simmer until apples are soft (10-15 minutes). Allow to cool a little and ready to serve if you like it chunky, or else bland to a puree. Serve warm for breakfast or as an afternoon snack. 1 tbsp. Ghee, 50g jaggery (or raw cane sugar), 100g desiccated coconut, 200 ml coconut milk, 250ml soya milk, ½ tsp. Cinnamon, 1 tsp rosewater (optional), 3 ground cardamom pods, 3 heaped tbsp rice flour. Add a little water to desiccated coconut to soak. Place ghee and jaggery in pan and heat till sugar starts to melt. Add soaked coconut, spices, coconut milk and soya milk, bringing to boil. As soon as liquid is hot, gradually adding the rice flour and beat with hand whisk to prevent lumps. Stir over heat for 3-4 minutes and the pour into a nice bowl to set for 2 hours or eat warm. OK- not strictly Ayurvedic in an ancient sense, but a healthy alternative to all the what sugar laden treats being pushed on children and adults alike…Gluten free, not much maple syrup and full of a vegetable. What’s not too love?! Preheat oven to 160C/ 325F/ gas mark 3. Steam the sweet potato. Break the chocolate into pieces and melt over a saucepan of hot water (or place over the sweet potatoes whilst they steam). Drain sweet pot and mash well, set aside to cool. Take choc of heat and add melted coconut oil and maple syrup. Stir choc mix into sweet potato mash, then add all the other ingredients. bake in a lined tin for 30 minutes or so until crusted on the outside but squidgy in the middle. Allow to cool and cut into squares. Yum! Preheat the oven to 160° C, and line a bread tin with parchment paper, or grease it with coconut oil. Blend all ingredients except choice chips in a blender. When they are mixed well, add the chocolate chips, and transfer the batter to the bread pan. Use a spoon to level the batter across the pan evenly, as it will be sticky and thick. Bake for 20 minutes, leave it to cool then slice and enjoy! Often served warm as a breakfast treat and as prasad after satsangs at Sivananda Centres. 200g course semolina; 250ml water; 50g ghee/unsalted butter; 1 tsp. ground cardamom; 50g cashew nut pieces; 50g raisins, 150g jaggery.Toast semolina in a hot dry frying pan, stirring constantly until it browns slightly and gives off a nutty aroma. Stir in ghee/butter and set aside. Toast cashew nuts in a hot dry pan until slightly browned and set aside. Put jaggery and water in a pan and bring to the boil. Reduce the heat and mix in the semolina, ground cardamom, raisins and cashew nut pieces. Cook, stirring continuously, until the mixture has thickened. Remove from the heat and spread the mixture evenly on a serving plate. Leave to cool, then score into diamond shapes to make serving easier. 3 large carrots, water, ghee, jaggery, 4 cardamom pods ground, ¼ teaspoon cinnamon, 2 tbsp ground almonds or dessicated coconut, ¼ cup of soya or rice milk.Finely grate the carrots (or other vegetables- this is important as thick grating won’t look so appetising!) and add to saucepan. Add all other ingredients (except soya/ rice milk). Simmer with lid on a low heat for 20 minutes until carrots are soft. Add soya/ rice milk to loosen the mixture. As an alternative, halva can be made with carrots (or sweet potato or courgette). Boil 750ml milk with 2-6 teaspoons of basmati rice. Add sugar/ alternative sweetener (NB: one without a strong taste, such as jaggery, which would spoil the taste of the kheer), ground cardamom and ground almonds and a handful of raisins. Delicious and filling. You can try the following variations on the basic kheer recipe: Add two teaspoons of Shatavari and cardamom to make a cooling, antacid recipe, good for women, and an aphrodisiac. 6 cups milk; 1.5 cups basmati rice; a few strands of saffron, 15 cardamom seeds (not pods! 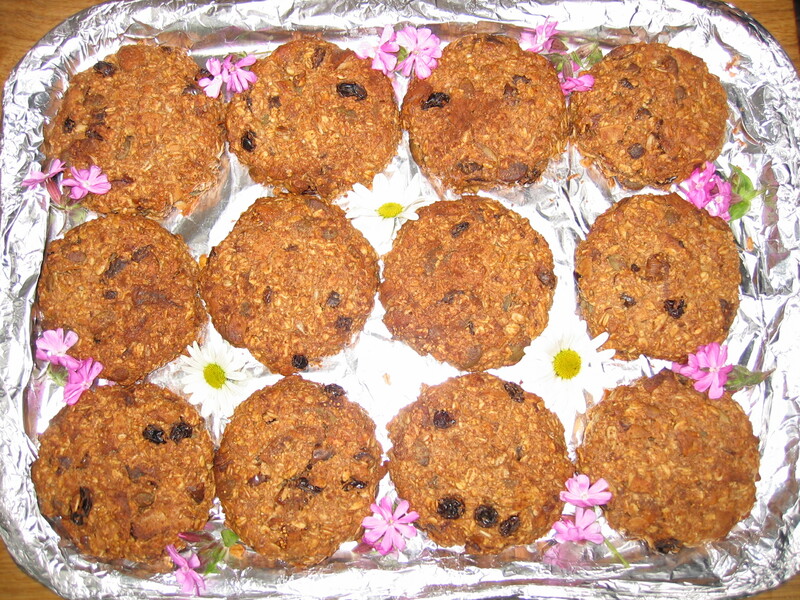 ), 2 tablespoons date syrup, ½ cup raisins, ½ cup toasted sunflower seeds, ¼ cup dessicated coconut. Wash rice until water runs clear. Combine rice, milk, saffron, raisins, and cardamon seeds and cook on low heat for about an hour. When rice is done, stir in sweetener, garnish with the coconut and toasted sunflower seeds and serve. NB: You should not eat this pudding with weak digestion as it is heavy to digest! It gives strength to all the body’s tissues, and is especially good for sperm! These are served at Sivananda Yoga Centres. Delicious! Preheat oven to 200 C/ 400 F/ Gas mark 6. Oil 2 baking sheets or use greaseproof paper. Combine dry ingredients in a bowl, add oil and mix. stir in enough water to make a firm texture. Take a ping pong ball sized amount and shape into cookie shape (about 10cm in diameter). Repeat with rest. Bake in oven for around 15 minutes until golden at edges. Cool on a wire rack. Try experimenting with adding goji berries, raw cocoa nibs etc. Blend the above in a good blender until smooth (around 1 minute). I don’t have a Vitamix but this would make it even creamier, adding the syrup first. Add a splash of water or a banana to make a lighter mousse for children. Taste and adjust sweetness if needed. Spoon into small bowls and set in fridge. This makes enough for 8 people, so you may want to halve the recipe. ½ cup raw tahini, ½ cup desiccated coconut, 1 cup of dates/ raisins/ figs/ dried apricots; ½ cup of nuts or seeds (peeled almonds, cashews, sunflower, pumkin, walnut, hazlenut etc). To coat the balls- dessicated coconut, sesame seed, ground almonds, raw cocoa powder. Put all ingredients in blender and mix on maximum speed until firm enough to handle. Roll mixture into bite sized balls. Then coat in then in dessicated coconut, ground almond, sesame seeds or raw cocoa powder. You can chill for an hour before serving or enjoy straight away. You can also experiment with adding any ‘superfoods’ such as goji berries, raw cocoa nibs, lacuma, favourite nut butters…. whatever you can think of! If you find dried fruit hard to digest, you can soak it in warm water for a few hours before making these. If you do this, they need to be stored in the fridge, but they won’t last long. Children really love getting their hands sticky whilst making these healthy snacks. Perfect for lunch boxes too. 15 organic chopped dates, 125 g ghee, 150g brown sugar/ jaggery/ date syrup/ brown syrup, 2 teaspoon cinnamon, 3 ground cardamom, large handful of sunflower and pumpkin seeds, large handful of raisins; 500g of rolled porridge oats, rice/ soya milk. Put dates in pan with a little water and cook for 5 minutes until soft then blend into a thick paste. Add ghee and crumbled jaggery into the pan and melt over a low heat. Add the spices, seeds, fruits and enough oats to make a thick consistency, mixing all ingredients. Add some rice or soya milk and stir th mixture over heat for a few minutes, adding more oats to bulk up the mixture. Cooking the oats in this way makes them soften and the flapjack bind. After 5 minutes of cooking, pour onto a baking sheet or in a flat oven dish and flatten down with a spoon. Place in a preheated oven and bake for 30 minutes at 160 degrees Celsius/ Gas mark 4 until they are golden brown on top. Teas can be made with freshly ground herbs and spices, for every day use or as remedy for colds and other ailments. Make your own tea by bringing all ingredients to the boil for 20 minutes. Cool for a few minutes and then strain. Ashwagandha & Shatavari ­- for stress, nervous disorders, aphrodisiac and general tonic. In a stainless steel pot, cook the water, turmeric and black pepper until it forms a thick paste, stirring and cooking for about 7-10 minutes. Remove from heat and add virgin coconut oil, using a whisk to fully mix in the coconut oil. Transfer the Golden Paste into a glass jar with a lid, and store in the refrigerator for up to 2 weeks. Use this paste to make golden milk by adding a teaspoon Golden Paste to 2 cups milk and gently heating Add optional vanilla, date syrup or cinnamon. Next time you think about having a cup of coffee, try some Golden Milk instead. Drinking a cup of Golden Milk every day could keep the doctor away! Golden Paste can also be used in smoothies, to make salad dressings, in curries, or any way your heart desires, and pets love golden paste too! See here for a good summary on the benefits of this spice. Heat 350ml water with 120ml of organic mil (or almond, rice or soya milk). Add the following spices: 3 black pepper coins (omit if you are feeling too ‘hot’! ), 8 green cardamom pods (lightly bashed to open the husks), a small pinch of green fennel seeds, 1 cm cinnamon stick or a good pinch of cinnamon, a good pinch of turmeric, and 3 slices of fresh ginger. 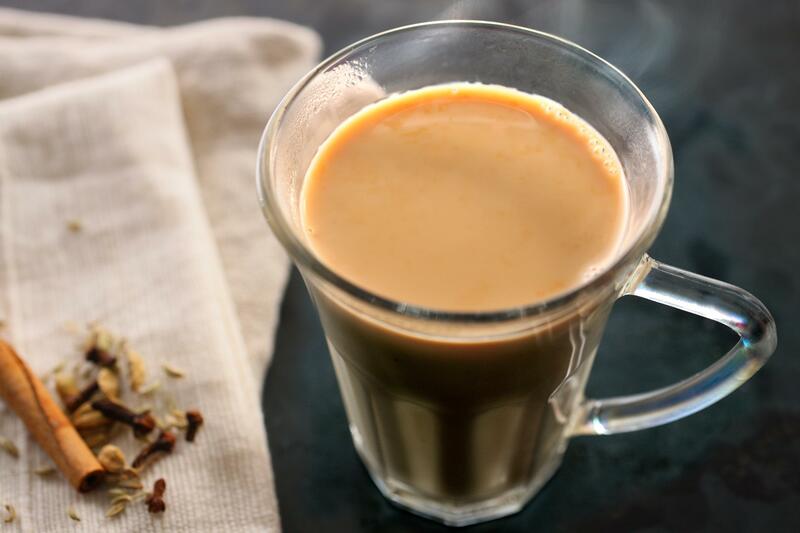 Once it comes to a boil, simmer for 20 minutes or until the chai reduces to one large cup. Add a teabag (black, green or roibosh or omit tea altogether) and let it brew for 1-2 minutes. Strain into your cup and sweeten if desired with maple syrup, rice syrup or honey- but only add honey once it has cooled to warm. NB: Cardamon helps neutralise the effects of caffeine tea and turmeric helps decrease the mucous increasing effect of milk, as well as being a marvelous herb for Winter). Use a large bunch of fresh mint in a tea pot of hot water, with 1 tsp. sweetener. Leave for 5 minutes then serve. 1 bottle organic red wine/ non-alcoholic wine. 1 teaspoon each of cinnamon, cardamom, clove, ginger, fennel. ½ teaspoon of cumin, coriander, nutmeg, black pepper. Heat wine to just under boiling, then remove from heat and add herbs. Cover and steep for 10 minutes. Strain herbs (through a cloth if powdered herbs were used) and serve warm. I am grateful to Visha Gupta and his wife who gave me Ayurvedic cooking lessons in his Ayurvedic Restaurant in Rishikesh (AyurPak). Do go and visit! 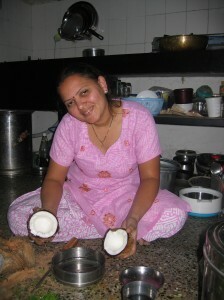 Also to Dr Suraj Marda (pictured), who shared family recipes in her home cooking lessons in Pune in 2008. Please see Recommended Reading for Ayurvedic cookbooks which have inspired.